Before I start talking about the light I just wanted to let you know that their packaging is rather gorgeous. It reminded me directly of the cardboard box of the Fireflies ROT66. It is very sturdy, and it has a magnetic flip open lid. The A21 screams quality, and I am quite surprised that such a new flashlight manufacturer starts off with this kind of flashlight. 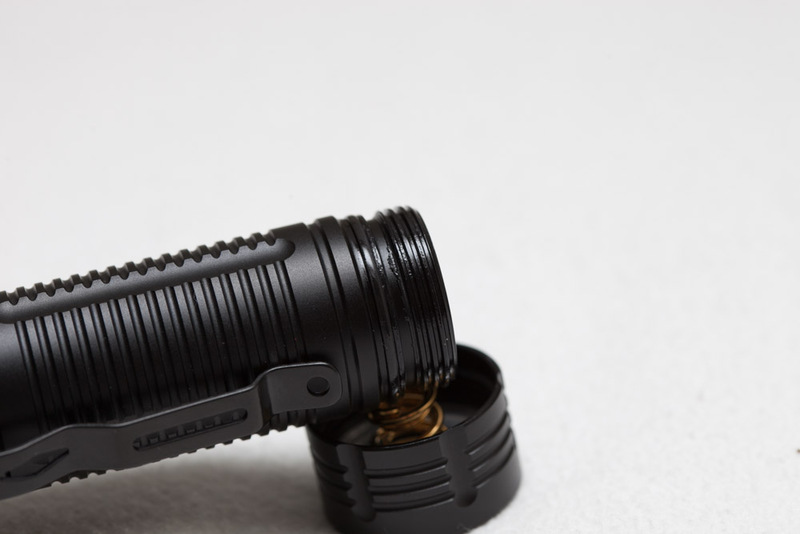 Since it uses a 21700 battery, the body has a nicer diameter than a 18650 flashlight. I will go more into details below. As I had just said, the Wuben A21 scream quality. It is almost unbelievable to see such a new brand with this kind of flashlight. I almost think they are a sister company of another 'famous' brand. How else would they be able to product this kind of flashlight. Anyway, the build quality is top notch. The anodizing is like any other premium manufacturer. The stainless steel bezel makes it look even better. You'll probably only see them once! Why am I saying this? Well, because the tailcap is very difficult to unscrew. That is probably for a reason. The battery should be charged inside the flashlight! Once its unscrewed its easier to put it back on again, but the first time it is really, really hard to unscrew. I mean really hard. The threads are square cut, and no anodizing is missing. I already touched upon the bezel which is made of stainless steel and has a slight crenelation. The reflector is likely to be made of aluminum. It looks like everything is glued, so its impossible to open without heating. The Orange Peel reflector will smoothen the edges on the beam profile, and at the same time gives it a less distinct hot spot. The Wuben A21 includes a strike-bezel that , according to their explanation, can break windows and help as a self-defense 'weapon'. 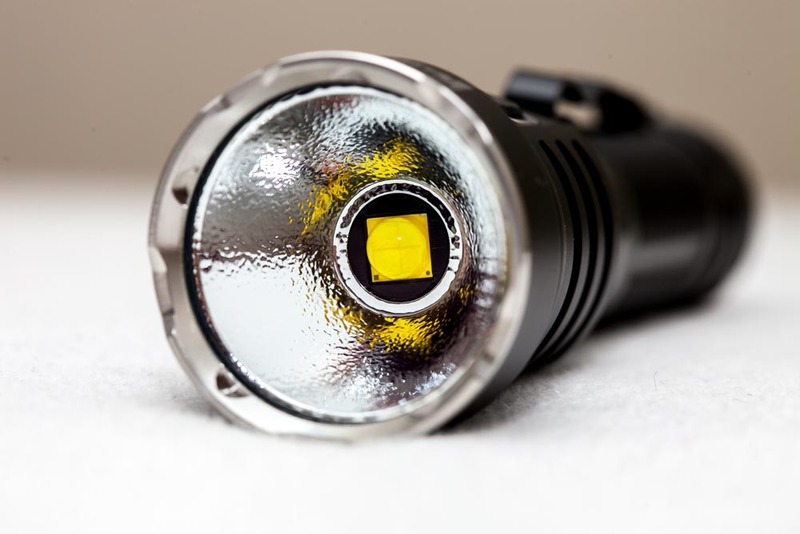 The Wuben A21 uses the CREE Xlamp XHP70.2 led. The XHP70 LED is a 6V/12V LED so it uses a booster driver in order to provide enough Voltage to the LED. Since the A21 only has 1 switch, it is used for power and mode switching. The A21 has a hidden ramping mode. From the OFF position you have to do a double click to enter ramping mode. Press and hold the switch to ramp output up and down. Yes. The last used mode will be memorized. Yes. from OFF: use a triple click to enter Lock-out mode. Another triple click to leave lock-out mode. The Wuben A21 was provided with a 21700 battery (4800mAh) and I would suggest keeping the battery inside the flashlight at all time. Why? Because the tailcap is really hard to unscrew, and the battery doesn't fit 99% of the available chargers. I use the SkyRC MC3000 charger analyzer, but it doesn't fit! The battery is too long. The other reason is the built in charger. The Wuben A21 uses a USB C type port and cable. The specifications say it can charge at 2 A. I tested mine with an Xtar Vi01 USB current/voltage detector, and it showed 1.8Amps max charge current. That is in my opinion definitely good enough! Also, the USB C plug makes it easier to charge since you don't have to worry if the plug is up-side-down or not. So that is another big plus. One thing that I am a little worried about is the parasitic drain. Parasitic battery drain is a continous slow discharge of the battery because the circuit is active. Usually electronics inside the flashlight use a very small amount of energy. This will result in a faster discharge of the battery. The Turbo measurement seems a little odd. 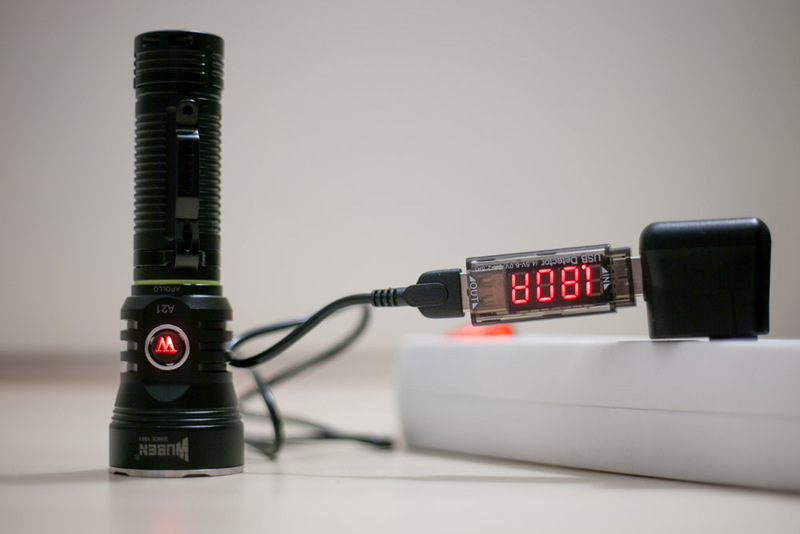 While less than 1 Amp more than High, the Lumens are more than double. This is probably an error on my side. From 1 minute onwards the light decreased in output to 35% output.. This decreasing in output too about 2 minutes. After almost 3 hours I couldn't see much light, but it was still 180 lumens or so. So I just stopped the test. So its roughly 3 hours of runtime, but at a very low output. Measured with the included battery in my homebuilt integrating sphere. 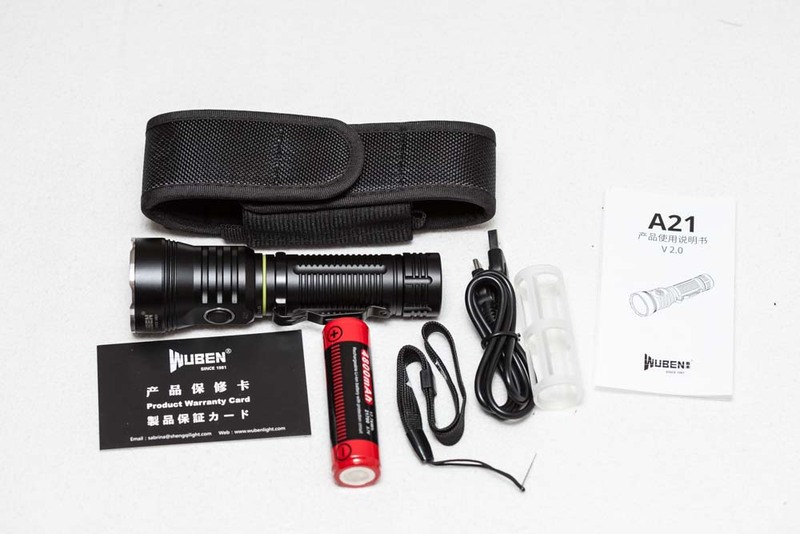 The website of the manufacturer (Wuben) claims the A21 to be 4200 lumens. My measurements were pretty close! So their output claims are trustworthy! It definitely is more of a flooder. The hotspot is pretty wide. See the shots below. This time I used the Samsung INR21700 40T. The reason for using this battery is simply because the included battery was almost empty when I wanted to measure the throw. LOL. That happens a lot.. Just at the time I feel like I want to do a runtime test, or a throw test, the battery is not fully charged.. Anyway. This time it was measured outdoors at 10 meters distance with the Skytronic LX101 Lux Meter.